Can Atheists See the ‘Forrest’ for the Trees? There seems to be no doubt that Forrest J Ackerman was a lifelong atheist. 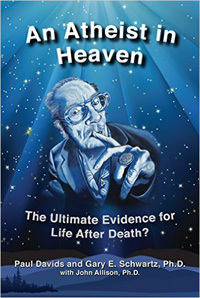 “He did not believe there is a God,” Dr. Gary E. Schwartz, professor of psychology, medicine, neurology, psychiatry and surgery at the University of Arizona, offers in the Preface of An Atheist in Heaven, a 514-page book just recently released. “He did not believe there is a heaven. He did not believe there is an afterlife. 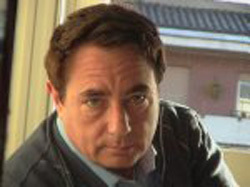 He did not believe humans have spirits or souls.” Yet, Paul J. Davids, (below) the lead author, and co-author Schwartz offer some very convincing evidence that Ackerman survived his physical death. Whether Ackerman survived in the “heaven” of orthodox religion or was at a more earthbound level of the afterlife spectrum is another question, one on which the reader can only speculate. “We are using the word ‘heaven’ in its more abstract, generic and spiritual meaning – a ‘higher place’ of existence that is typically more loving, joyful and peaceful that what we experience on earth,” Schwartz clarifies. Ackerman, who like President Harry S Truman had one letter for his middle name (no period after it) and was known to many as “Forry” or “Uncle Forry,” died at age 92 on December 4, 2008, after a long career in which he created and edited Famous Monsters of Filmland magazine and became known as “Mr. Sci-Fi.” Davids, a sci-fi enthusiast during his youth and now an award-winning Hollywood film director, met him in 1963 and remained a friend through Ackerman’s lifetime. “And I believe I have learned over the past eight years that friendship does not end with death,” Davids offers. Strange as it may seem, a mere “ink obliteration” on a page printed from Davids’ computer triggers the whole story. It was not a smudge or a blot, but some meaningful words mysteriously blocked out on the page that was first of many signs that suggested Ackerman was trying to let Davids and others know that he was still around. And there is something of a paradox connected with this ink obliteration. It has to do with replication – that part of the scientific method that the fundamentalists of science rely on to reject evidence strongly suggesting the survival of consciousness at death. These fundamentalists claim that the abundance of psychical research favoring survival is not acceptable because it can’t be replicated under the strictest conditions. In the case of the ink obliteration, however, it is the fact that science has been unable to replicate it that gives it special meaning and lends itself to the survival hypothesis. In other words, the paradox here is that replication of the ink obliteration, something two chemists devoted much time to, would have run counter to the main message of the book, that we do survive death. Davids, who grew up in a non-religious home, then encounters numerous anomalies, many of them synchronicities, taken by Davids as possible signs from Ackerman. They include a wide range of weird things, including inoperable clocks chiming, phones crawling along a counter, a very unusual CAPTCHA code on a computer, bowls moving themselves across a room, many disappearing objects, meaningful spider bites, voices from a dead computer, blue jeans dissolving in front of many witnesses, meaningful computer glitches, manipulation of electromagnetic fields, alarms sounding unexpectedly, and “dozens” of other strange phenomena suggesting that an invisible intelligence is causing them. In fact, Davids chronologically lists 142 of them in the Addendum to the book. At some point during his many odd experiences, Davids consulted Schwartz, author of The Afterlife Experiments, The G.O.D. Experiment, The Energy Healing Experiments, and The Sacred Promise, who encouraged him to further document his experiences and write about them. In addition, Schwartz recommended that Davids sit with two mediums, both of whom provided evidential information suggesting communication from Ackerman. Schwartz contributes seven very interesting chapters to the book, discussing Davids’ experiences, skepticism, mediumship, and survival research. A recent segment of the Travel Channel’s “Mysteries at the Museum” series dealt with the “Margery” mediumship, previously discussed in my January 11 blog. The television presentation is an example of how history is distorted and mediums maligned by biased historians and journalists who know little of the subject. The program involved cherry-picking, hearsay, distortion of facts, sensationalism, misinformation, and most of all incomplete information. The program host, Don Wildman, began by saying that Margery, the pseudonym given to Mina Crandon for privacy purposes: 1) claimed that she can communicate with the dead; 2) that Spiritualism was “on the rise” during the mid 1920s when she was demonstrating her mediumship; 3) that she “desperately sought fame” by attempting to win the $2,500 prize offered by Scientific American Magazine for anyone able to prove mediumistic ability; and 4) that she was a mystic. All four statements are highly questionable, in that: 1) Margery never claimed she could communicate with the dead. 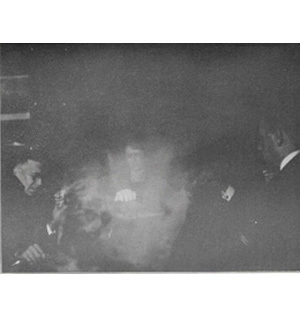 The claim was that the dead could communicate through her with others while she was in a trance condition; 2) Spiritualism had peaked during the late 1800s and had a resurgence during World War I, but indications were that it was in decline during the 1920s; 3) Margery was the wife of a respected Boston surgeon who also happened to teach medicine at Harvard University. Thus, she was living comfortably and had no special need for the $2,500 prize or great fame. She was persuaded to enter the contest by Sir Arthur Conan Doyle to prove the genuineness of mediumship and apparently agreed to give the prize money to charity. 4) True mediums are rarely mystics, although this is a matter of definition. Margery never claimed to be a mystic. It was also mentioned, at least implied, that Houdini built the bell-box, which I do not believe is correct. Indications are that it was in use before Houdini even came on the scene. He built a cabinet to restrain Margery, but I doubt that the bell-box was his idea. 1) The bell-box was usually at least nine feet away from Margery when it rang, well out of reach of her stretched leg and toes. In many cases, it was held on the lap of someone sitting at the table some distance from Margery or was on the table in front of the person, clearly out of Margery’s reach. 2) While the ectoplasm exuded by Margery was sensitive to light and required darkness, a red light was frequently used and Margery’s hands were always held by the person sitting next to her for test control purposes. It would have been extremely difficult, if not impossible, for her to bend over and get her head centered under the table to raise it without the persons holding her hands feeling the movement of her arms and entire body. 3) Various other phenomena were produced, including communicating raps, table-tilting, strange lights, telekinesis, trance-voice, direct-voice, trance-writing, automatic writing, and materializations of spirit forms. Communication came through in nine languages, including ancient Italian and Chinese. The most frequent communicator was Walter Stinson, Margery’s deceased brother. Walter would speak through his entranced sister and also independently of her through a trumpet, would carry on conversations with the sitters, joke with them, whistle tunes, and do automatic writing through Margery. The voice was masculine and in character with the Walter that some sitters had known. Moreover, Walter would sometimes provide information which Margery could not have known. 5) Thumb prints of Walter were taken, one of them matched up with the only print left behind by him (although another thumb print mysteriously turned out to be that of Margery’s dentist, from whom the wax was obtained). 6) Margery was studied by a number of scientists and scholars, most of them testifying to the genuineness of her ability, although some sat on the fence and did not commit themselves, apparently for fear that their reputations would be damaged. Several had one sitting only and concluded it had to be fraud as what they observed was not possible. Like Houdini, Dr. Joseph Rhine, who lacked experience in physical mediumship, detected movement by Margery and concluded that she was a fraud, but others understood that slight movements by Margery was natural to such trance mediumship as earlier researchers with Eusapia Palladino and other mediums had observed “synchronies” between the medium and the movement of objects well away from her reach. That is, her fingers, hands, and feet seemed to be moving in harmony with activity producing a certain phenomenon out of her reach, something of a puppet effect, the ectoplasmic “strings” between the medium and the object not being visible. 7) There were indications that Houdini tried to plant incriminating evidence against Margery. On one occasion, an eraser was found in the bell-ringing mechanism and was believed to have been planted there by Houdini to prevent the bell from ringing, while on another occasion a fold-up six-inch ruler was found in a cabinet built by Houdini to restrain Margery, apparently a plant by Houdini to frame her by claiming she extended the ruler to reach out and effect certain phenomena. Jim Collins, an assistant to Houdini, is said to have later confessed to putting the ruler inside the box. T. Glen Hamilton, M.D., perhaps the most competent and experienced researcher to study Margery, sat with Margery on eleven occasions, twice in his own laboratory in Winnipeg, Canada, under strictly controlled conditions, and was certain that the phenomena he witnessed were genuine. Margery was thoroughly searched beforehand and restrained during the sittings and several other scientists observed with Hamilton. “I have no hesitancy in again stating that I am quite convinced that the Margery phenomena are not only genuine but are also among the most brilliant yet recorded in the history of metapsychic science,” he reported. Dr. Mark W. Richardson, a professor of medicine at Harvard, had dozens of sittings with Margery and even constructed a machine to verify that Walter’s voice was not Margery’s. He was equally certain that her mediumship was genuine. Dr. Robin Tillyard, a fellow of the Royal Society, called her mediumship the “most marvelous” in the history of psychical research. Clearly, the “third arm” or “third hand” is beyond science and one of the reasons mainstream science cannot accept such mediumship. It is not acceptable as a starting hypothesis and unscientific as an ending conclusion. However, there have been a number of respected scientists who have observed it with other mediums. Dr. William J. Crawford, a mechanical engineer and university lecturer, had considerable experience with physical mediums. 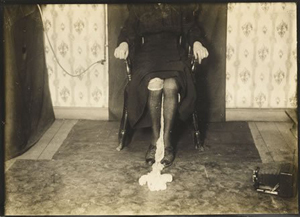 “In the phenomenon of levitation of a table or other article a psychic arm extrudes from the medium – I do not mean an arm in the sense of the human arm, but a projection of some kind from her body,” he wrote of the medium Kathleen Goligher. “Now this projection or extrusion is practically invisible and impalpable – it is impalpable except just at its free end, where it grips or presses on the body it is levitating – yet it transmits throughout its length great stresses, as is obviously the case when it sustains at its free end, as it has done, a body (heavy table) weighing thirty and forty pounds. 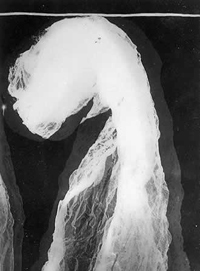 Again, this structure seems to contain within it quite a lot of matter temporarily borrowed from the body of the medium.” Crawford photographed the ectoplasm emerging from Goligher, both in the flowing stage and as it took shape. As stated in that January 11 post, many researchers, including Dr. Charles Richet, a professor of medicine at the University of Paris, and Sir Oliver Lodge, a world-renowned physicist and pioneer in electricity, observed “extra” arms with the medium Eusapia Palladino. They called them pseudopods. J. Hewat McKenzie, founder of the British College of Psychic Science, reported that such third arms are very common among physical mediums. He explained that when the ectoplasm is insufficient to create a full form “the spirit operators may solidify only a hand and an arm, or even a hand alone.” He described such limbs as “stick like” with anywhere from three to five fingers, and protruding from various parts of the body. “This part-projection of soul is manipulated by the will of the operating spirit, and is not under the control of the medium,” he explained, adding that the limb can extend out several feet and grasp objects, as may be necessary to produce phenomena. But all this is above the boggle threshold of most people. “All just tricks which magicians understand better than scientists,” is the debunker’s usual response. And so it goes. I find it much easier to accept the observations of scientists like Richet, Lodge, Hamilton, and Crawford than those of some magician out to add to his fame and ego. It would be one thing if those scientists had observed the mediums only a time or two, but those men had countless sittings with various mediums under controlled conditions. Richet reported over 200 sittings with Palladino and Crawford recorded 87 sittings with Goligher. Keep in mind that Hamilton studied Margery in his own laboratory, where there was absolutely no opportunity for her to smuggle in objects to use as tricks, and Mrs. Hamilton strip-searched her beforehand.